This quiet and peaceful guest cottage in the woods is surrounded by 3 babbling streams and 4 acres of trees. Steps from the Delaware River and a 20 minute drive to the super cute town of Narrowsburg, NY! Perfect for a couple or family. Visit the cottage and walk out your sliding door to your private patio where you can grill, swing in the hammock, and listen to the streams! Full kitchen stocked with dishes, glasses, microwave, toaster, etc. * $50 Community Administration Fee for up to 8 passes. * $25 Community Late fee is charged if registration is submitted within 7 days of stay. * Passes are picked up at the community office. There is a $25 refundable deposit paid upon pick up which is returned when passes are returned to office. Registered Renters may use Masthope Amenities such as the Beach, Pool, Courts (Tennis, Basketball, Handball, etc. ), Boats & River Park at no cost. There are separate fees charged at the Fitness Center, Stables and Ski Area. The neighbors also say the original home was built by the famous local writer Zane Grey for his mistress so he could ride up and visit her a couple miles from his home down the river. I still haven't confirmed this information but many of the locals have told me the story behind three bridges. If anyone find out more info for me, please let me know! To view our larger Main House visit our listing at: http://www.homeaway.com/vacation-rental/p3767641 FOR COMMUNITY AMENITIES: **All guests must register for amenities with the community office 2 weeks prior to their stay. ** Please request more info and we can email you the registration form which can be emailed or faxed to the office. They will issue your guest passes to you upon arrival. The fees are paid directly to the community office and are listed below: $50.00 up to 3 night stay $75.00 4 to 7 night stay $100.00 8 nights to 30 days $150.00 30 to 60 days $175.00 over 60 days There will be a $25.00 deposit required to pick up the passes from the administrative office which is returned to you upon the return of your guest passes. Registered Renters may use Masthope Amenities such as the Beach, Pool, Courts (Tennis, Basketball, Handball, etc. ), Boats & River Park at no cost. There are fees charged at the Fitness Center, Stables and Ski Area. Really great spot if your looking to Ski Big Bear! Pit this very last minute trip together for my son and nephew! Tracey was great. Quick to answer my questions and allow me to make the decision to visit. Accommodations were not overstated but quite comfortable. The fire pit and the stream outside made for great atmosphere for s’mores and hanging out! My 2 year old lab had a great time exploring outside as well. Threw a few steals on the grill and enjoyed the fresh air after a day on the slopes. The inside fireplace downstairs with the TV allowed for some male bonding watching North Carolina - Duke Game. We were fortunate no one was in the main house so we had the property to ourselves. Had a few minor issues and Tracey responded immediately. Overall would definitely recommend. Must be beautiful in the Spring/Summer as well. The three bridges cottage is a great place to stay for a winter getaway. We especially loved that it felt very remote -- only views of trees from all the windows -- but was conveniently located near Big Bear ski (and tubing) mountain and not too far from towns with restaurants and grocery stores. The cabin has everything you need and is especially cozy with a fire going in the fireplace. We would love to return, hopefully in the summer to take advantage of even more outdoor activities! Also, Tracey is super responsive and helpful -- had only pleasant exchanges with her. Charming cottage nestled in the woods. My family and I had a great time at the cottage. We enjoyed the lake, pool and an excursion to Wallenpaupack. Upstairs bedroom was hot but there are fans to cool it down. Downstairs bedroom smells a bit musty. The kids and dog enjoyed exploring the woods and the streams. I rented the cottage for a birthday getaway for my outdoorsy boyfriend. It was absolutely what I was looking for. The cottage was perfect and the experience was awesome. We even had a deer come up to us and we fed it. Tracey was very helpful and responsive. We are already planning another stay in the fall! Thumbs up. Pictures don’t do this property justice. The cottage and surrounding property are perfectly rustic and charming. Falling asleep to the sounds of two streams and enjoying arching deer roam through the forest are just two of the unique features. What’s more, the owner, Tracey, was great to work with. She responded very quickly to questions, sometimes within minutes. A very quaint cozy cottage with ample room and amenities. Other Activities: Community Amenities Available. Includes Pool, Lake, Gym, Horseback riding, BBall courts, shuffleboard, handball courts, ice skating pond, canoe and boat rentals, game room. *All guests must register for amenities with the community office 2 weeks prior to their stay. Please request more info and we can email you the registration form which can be emailed or faxed to the office. The Country Club at Woodloch Springs is nationally recognized by GOLF Magazine as 'one of the finest courses in America' and rated “4.5 Stars” by Golf Digest’s Best Places to Play. Woodloch’s spectacular, 18-hole, championship, par-72 golf course winds its challenging way over 6,579 yards of fern-carpeted forest, lush wetlands and broad upland meadows. The outstanding signature 14th hole requires a dramatic 220-yard carry over “Hells Gate Gorge” which is carved from the rugged mountainside by rushing water some 200 feet below. Four sets of tees and alternating pin placements provide a variety of challenges, accommodating all levels of play. 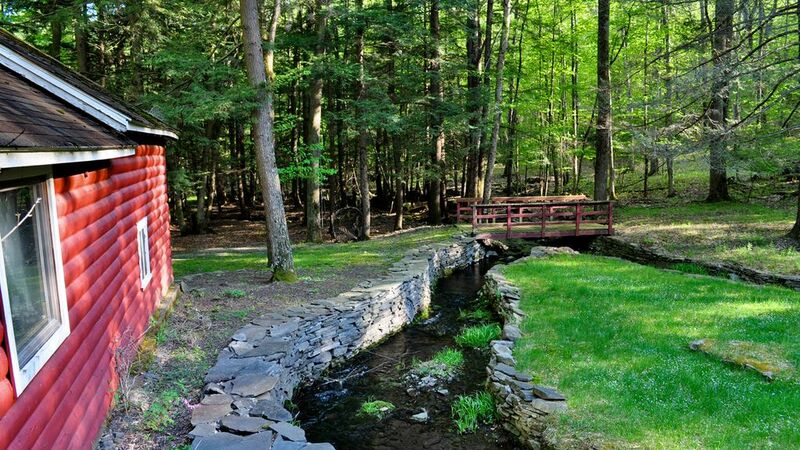 The golf course at Woodloch Springs is a family friendly course, dedicated to growing the game of golf. Visit our 16-acre, state of the art teaching facility for lessons tailored to your individual needs. John Pillar, Director of Golf at Woodloch Springs, and Secretary of the Philadelphia Section PGA, is recognized as one of America’s Top 50 Kids Teachers by US Kids Golf. Ski Big Bear offers 18 trails, 6 lifts including 2 Magic Carpet lifts, and 650' of vertical. The mountain is covered annually with approximately 50 inches of snow.